I’m back with more food from the grill. Ever since my husband got a fancy new grill last year for Fathers Day, I’ve been trying to improve my grilling skills. I have to confess that cooking where there’s fire and smoke involved scares me a little. However, like so much in life, practice and experience has helped tremendously. And, also knowing my limits. There are still certain cuts of meat I still wouldn’t trust myself to grill (i.e. thick-cut rib-eye) but I have successfully graduated to other cuts of steak like this flap steak. Spice-rubbed grilled flap steak has quickly become a regular part of our dinner rotation. Flap steak is a thin, relatively lean cut of beef. It also tends to be less expensive than most other cuts of steak. But the best part is that it is most tender when it is cooked to medium versus medium-rare which makes it more forgiving on the grill. 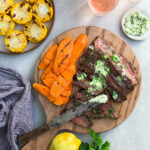 For easy weeknight dinners, I’ve been experimenting with spice-rubbed grilled flap steak with compound butters. Since there is no marinating required you can go from pulling stuff out of the fridge to eating dinner in a short time. The double punch of the spice rub before grilling and the topping of compound butter after grilling delivers all the flavor you need. I make up a batch of the spice rub and keep it in a spice jar to have on hand. The compound butter comes together easily especially if you have left some butter out to soften in the morning. You can get as creative as you want with compound butters. I decided to stick with the classic combination of parsley, garlic, and lemon zest for this recipe (though I did try a combination of cilantro, jalapeño, and lime zest that was also quite good). Great Grill Grub may be my motto for this summer. What do you think? Combine all the ingredients for the spice rub together in a small bowl. Mix together until all the spices are evenly distributed. Set aside. With a fork, mash butter with the parsley, garlic, and lemon zest in a small bowl until evenly mixed. Set aside. Season the steak on both sides with 1 teaspoon of the spice rub, salt, and pepper. Lightly brush both sides of the steak with some oil. Prepare the grill. When the grill is hot, place the steak on the grill and cook for 8 to 10 minutes, turning every 2 minutes, until cooked to your liking. Transfer steak to a cutting board, spread 2 tablespoons of the butter on the steak, and then cover it with a sheet of aluminum foil. Let rest for 5 minutes. Thinly slice the steak against the grain, and top with additional butter as desired. The spice rub will keep for several months stored in an airtight container. Recipe for the spice rub adapted from A Cowboy in the Kitchen cookbook.